Hello all Kitty Bee Design friends! Thanks for coming over from Kitty Bee to my blog! and I hope you are all having a wonderful St. Patrick's day with lots of LUCK, green drinks and 4 leaf clovers! However, because I missed making a card for Chinese New Year last month, I wanted to ensure I didn't miss it this month. 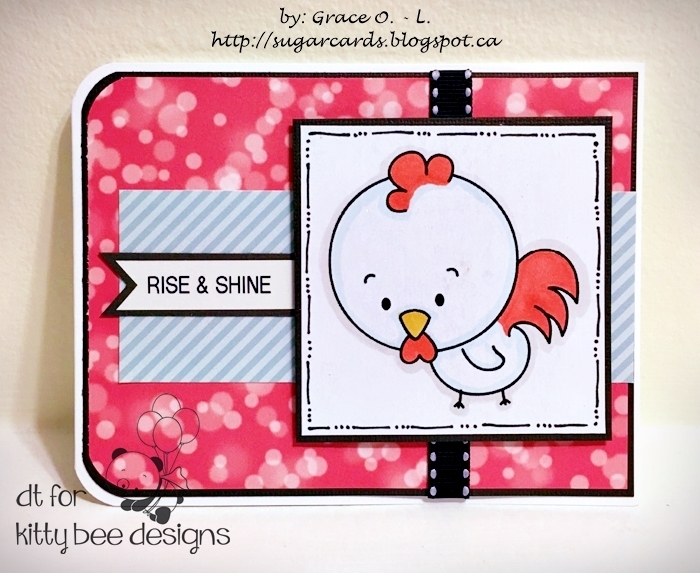 So, for my March 2017 Spotlight card, I used '2017 Year of the Rooster Zodiac' stamp! I thought this cute rooster was perfect for this holiday! For this card I used Lawn Fawn petite pack called: let's bokeh in the snow, Michael's Craft - recollection ribbon and 110lb cardstocks, my copic markers and a little wink of stella for the rooster's head and belly and I used my brother label maker for the sentiment. and if you love this digital image as much as I do, please head over to the Kitty Bee Designs Etsy shop! Happy Late Lunar New Year everyone!! !